As much as I wanted to believe in my mental shift when I wrote the post The Aftermath (take a moment to read this, it’ll give you some insights into where I am now), it’s just not where I want to be. I’ve done better. You see, I’m a yeller. My mom was a yeller and my sister does it to her kids. It’s not one of my proudest characteristics that I’ve gotten from family. But I do it. And I’m loud and I’m scary. No one wants to be the loud, scary mommy but that’s me. That was a hard one to admit just now. I am making changes to my anger issues because at this point, I’m smart enough to walk away. I distance myself from my son Jake before my anger escalates into a barrage of hurtful horrible words that you can’t ever take back. And I never feel good after I yell. I try to make myself feel better by remembering that I’m only human, we all make mistakes but most day, the words just feel like Charlie Brown’s teacher … wah wah wah. When the anger goes away, I feel this huge wave of sadness come over me. The sadness will stay with me sometimes as long as 24 hours past the incident. I’m upset with myself for overreacting and I’m disappointed with myself for hurting my son. I love Jake more than anything and when this happens, it leaves a big hole in my heart. After several hours of feeling that familiar sadness, I decided to give it a Google. I ran a search on ‘feeling sad after a parent yells’ and I couldn’t believe what I found. It’s called The Orange Rhino Challenge. The next challenge was going to start in 5 days. It was a message I couldn’t ignore so I signed up that night. I can tell this process will be full of twists and turns and enlightenment moments. I get that already. But I knew it would be like this the day after I signed up for the challenge. The next morning after handing over my email address to the challenge, I read through the woman’s blog posts and why she started the whole non-yelling thing. She didn’t just have one boy – she had four! She was like me quadrupled. Wish I had read this about 16 years ago! I’m going to sign up for it too. Thanks for sharing. Yeah, wouldn’t it have been great if people talked about this stuff back then? Thank goodness for blogs! I think you can still get it since we just started the challenge. But if you can’t, she’s got a LOT of great posts on her site where she talks about what she learned and the changes she’s made. Aw, mama. Good luck with the challenge. I am thinking about hypnosis for my mommy messiness. We all need help with something. Doesn’t make us bad parents. Thanks for the encouragement! I tried some meditation stuff but that didn’t work. Hoping that this challenge will give me some insights. And you’re right, I think it makes us better parents when we can admit we need some help. I especially like that last exchange between you and Jake. Powerful. I can relate 100% to feeling bad after yelling. It brings me to a bad place. I know, when he said that, I teared up. It took everything inside of me not to cry. It’s really hard to look at ourselves and why we yell. I never like the way it makes both of us feel so that’s why I signed up for the challenge. Why did you restrain yourself from crying? That’s a good question. I think I didn’t want him to see how much this was affecting me. I think that I worried if he saw me cry, he’d think he did something wrong, or I did something wrong … honestly, I don’t know why I held back the tears. Hmm. Something to think about. I think you may stop reading my comments – I am always giving you something to think about. I know! You totally make me think about my actions. From this point on, stop asking me questions that will make me think. Don’t hate me – tis who I am. I only yell at other drivers; they can’t hear me, but they deserve it. See now THAT I do! I live in Orlando and there’s nothing worse than tourist drivers. Thats a great post and a fabulous challenge. Thanks for your kind words. I’m doing my best on the challenge. Oh man, good luck! I’m not a yeller unless my very long fuse blows…even then, I try to keep it buttoned up. I commend you for taking positive action. Thanks for the support! I’m usually the Queen of Patience but when it comes to my son, it’s like he just pushes me to see how far he can go. And now that I’m starting to learn my triggers, it’s helping me control this yelling stuff. You are so brave for putting effort towards bettering your parenting. So hard when we are repeating what we knew growing up. Good luck and hugs! Thank you so much. I went years saying that this was how I was raised and its all I know. But the truth is, its what I learned and quite honestly, it scared me as a kid. I know how my son feels so knowing that helped me to do this challenge. omg, jake’s thank you made me cry. good luck!! He almost made me cry too! That was the moment I decided to write this post. And then it took me a few days to get the words together because every time I’d start to write, I would start to cry. I think it’s wonderful that you are making strides in changing the way you interact with your son. I have one son, too, and I yell. Sometimes I feel like it’s the only way to get his attention. Sometimes I think there’s probably a better way. I’ve read your site so I think we’re both in the sam place. I thought the same thing too – the only way to get him to listen to me is to yell. We’re going this part of the challenge called ‘kids are just kids’ and its been an eye-opener for me. I’ve been expecting adult behavior from my 9 year old boy. Wow, that was a big one to learn and to see how that is one ofmy triggers. You are definitely not alone. I’m a yeller too. I’ve come a long way (I used to throw stuff and break things), but I still have a ways to go. Frustration and feeling overwhelmed seem to be my yell trigger. I’m working through it and trying to avoid situations where I feel that way. I’m going to check out the links and see if I can sign up for the next one. Thank you for sharing! Yeah, I use to throw and break stuff too but that was more with my ex when we were married. I’m glad I never did that with my son. The not listening and disrespectful back talking are my big triggers but I’m learning some new techniques now to deal with this. And all I can is that I’m doing my best. Good luck with the challenge! The ending of this post is so incredibly sweet. I bet that served as extra special motivation! You are exactly right! I wasn’t sure I was going to write about this. I mean who wants to admit this stuff about yourself? But when my son said that, it just struck me right in the heart and I wrote down our exchange in my notebook. And then this post came from it. Bless you. I’m a yeller from way back and I’m learning, slowly, to change. I’ll follow your progress and look forward to more of your wisdom. God speed to us both! I’m starting to realize there are more of us out there than I thought. I wasn’t sure if I should write any updates on my challenge but like you said, if I have some huge ah-ha moments, I’ll write about it. My mom was a yeller, and I am loud and I yell, but for the most part, I don’t yell AT my son. I do slip every once and awhile, but I think that’s human. Now, not to say that I don’t have my issues! I’m looking forward to your journey during this! That’s funny you say that. One of the tricks she’s teaching is to yell AWAY from your kids like into the toilet or the fridge. I slip more than I’d like to admit. And I’m impatient and snappy too but I’m learning that’s my issues not the fact that he’s being too loud or not listening to me. It’s hard to modify some behaviors, especially those we’ve had for what feels like forever! I do find myself telling T I’m sorry for being cranky, and ask for his help on working on it. I figure it’s a start – and I’m making a conscience effort to be less cranky. So, I’m excited for your journey, too, I like when I’m not the only one working on this issue! Like I said, I’ve learned to walk away but haven’t completely stopped the yelling. I spent WAY too many years fighting with Jake’s dad when we were married and we’d go on for hours. Sometimes Jake wants to fight with me like this and he reminds me of his dad. It takes everything inside me to walk away and not feel that familiar tug to want to argue. I wasn’t sure if I should post again about the challenge but it sounds like a few of you are interested so I’ll work on the challenge for another week and come back to tell you all what I learned. Yay! I’m glad to hear that you’ll be posting more! 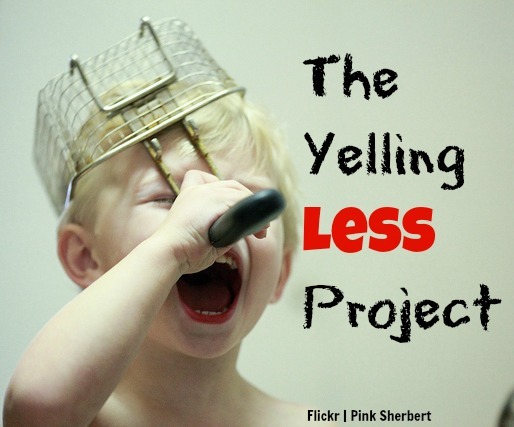 I’ve often wished I had caught on to the “yelling less” thing when my boys were small. Once they were teens, I finally learned to walk away before I started yelling. Except for when it sounds like they’re coming through the wall or about to break something. I’ve been trying to walk away too but something would happen and I would yell again. I’m hoping that I can figure this out BEFORE he gets to be a teen because I know how hard THAT’S going to be. This is so challenging! Good luck with this and I appreciate your honesty and being real with this. Glad you linked in with Yeah Write! Good luck with the challenge! I was raised by a yeller, too. I try to avoid it, but I’m as perfect as any other parent. Good luck! Thanks for the support! It wasn’t fun being raised by a yeller and I think about that every time I yell at my son. I know how much it hurt when I was kid. Wow! You are brave to admit this here — and therefore an inspiration to those who aren’t so brave. I’m sure you’ve sent some people along to the challenge with this blog post. Good luck!! Thanks – I actually debated about whether I wanted to write this or not but I figured that others might want to know about the challenge. Plus, it always feels good when others admit to it too .. it makes you feel like you’re not the only one. I’m a yeller and apparently an “ugly face maker.” Now that my kids are older they like to egg me on to see what it will take to get me to yell. On graduation day last week my son said something that pushed me over the edge (yelling through clenched teeth) and then said “I’m only kidding I just wanted to see you make that face, it’s so funny” Seriously! I’m glad you’re nipping this now before Jake starts to think your anger is hilarious and uses it for entertainment. Your son did that? Are you kidding me? And yes, that sounds like something Jake would do to me just to see how far he could push me. I’m glad to be working on this too. It’s something that’s been bothering me for awhile and the thought of Jake growing up in fear of his mother, just concerns me. But on the other hand, man this is tough looking at yourself!